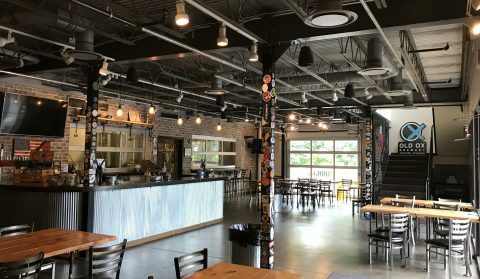 Due to construction in the brewing area, we are not currently offering public tours. We hope to be back up and running soon! Planning on bringing a group of 10 or more to Old Ox? Fill out this form to contact our Tasting Room Manager, to learn about reserved seating, food arrangements and any other special requests that you have. We look forward to making your event a memorable occasion! Thirsty and hungry? Every day we partner with a different local food truck or restaurant, and let us be the first to tell you they’re goooood! Check out what’s on the menu today by clicking here. We love dogs! Unfortunately, we cannot allow any dogs inside the brewery but they are always welcome on our outdoor patio! Exceptions to this are for service animals as defined by the Americans with Disabilities Act. Please visit this page for complete details. Want to know what beers on currently on tap in our Tasting Room? Click Here. Look for our sign between mile marker 25 and 25 1/2 of the W&OD Trail. We’re cycle friendly: beer – bike rack – air – bike tools – food – H20. Oh yes, and really clean restrooms.